Google published a foreign patent at WIPO today that has an interesting perspective to it. When someone performs a search that involves a specific entity, their search may be influenced by the search engine’s knowledge of their past interactions with content involving that entity. In some applications, the server-based system additionally receives and stores information describing the user’s consumption of the content. For example, the system can determine that the user viewed the movie “The Social Network” featuring “Justin Timberlake” on a particular date and at a particular location. The system can store the information at the media consumption history that identifies the particular date and the particular location where the user viewed the movie “The Social Network,” and can subsequently receive a request that identifies the user and “Justin Timberlake.” The system can provide a response to the request that includes information about “Justin Timberlake” and can also indicate that the user viewed the movie “The Social Network” that features “Justin Timberlake” on the particular date and at the particular location. Th patent discusses collecting a media consumption history including a time and location of where someone might have watched a movie or listened to an album in the past. This might be done using an application like Search Sound for Google Play, which can listen to a song to identify it. That kind of identification capability might enable the collection of a media consumption history for an individual who owns a device capable of performing such searches. According to this article, Google Now can Identify songs presently, too. 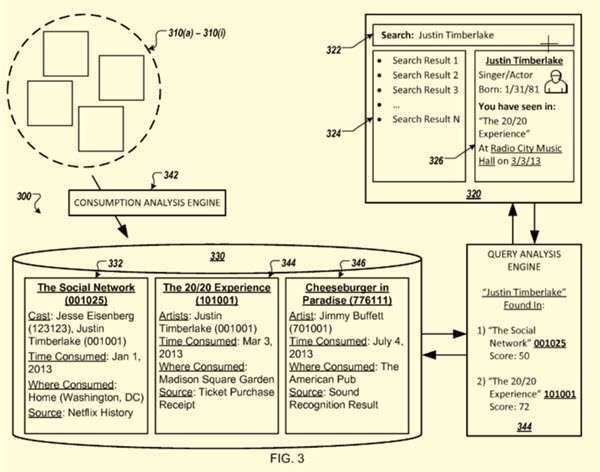 The patent tells us that information about which movies a searcher may have watched could also be collected as well. There is an app for Android that can identify movies and TV shows, called IntoNow that is the kind of thing that could be used to capture that kind of information for movies. That searcher’s previous media consumption history could be searched to identify other movies that the actor asked about may have performed in. This is interesting because there are apps that can look up and identify media like this patent describes, and the idea behind Google collecting a media consumption history sounds like what Google has been doing for years collecting a browsing history to personalize search results for searchers. When I wrote last year about Google Granted Patent on Using What You Watch on TV as a Ranking Signal, a few people asked me if that process involved Google listenining to what you might be watching at the time on TV. It wasn’t, but rather involved Google having an idea of what shows were on television at the time you were searching, and whether or not your query seemed like a good fit for a TV show that was being broadcast at the time. In this patent, Google is listening to what you are in terms of songs and movies, and keeping track of it, so that if you have any questions about entities that appear in those things, it can answer them for you. Thank you for writing this landmark post. I hope you will write more landmark content. Which is good. Thanks for sharing, very interesting. Do you actually know if it exists a similar patent for digital readers and eBooks ? As the content is text, it would be even easier. Google never stops to surprise. It took search to an another level, keeping a history of the movies, TV shoes you have watched or songs you have listened to and then give you a personalized experience based on that history. I do not know what next to expect from Google? This sounds interesting feature in google’s search. And i agree with cathy. Expect the unexpected with google always. Thanks for sharing. i always look on to you posts for such interesting information. keep doing the good work. Thanks again! Google has now become smarter than many people in the world. It has taken searching to the new level. This patent took me by surprise when I read it. I do like not being able to know what to expect from Google, next. Thanks, I’m happy to hear that you enjoyed this post. I really like running across ideas and concepts like this one when I run across them in Google’s patents. They are looking for new ways to do things, which is good to see. It’s interesting that Google may be doing something like this. I’ve seen a few ‘BIG BROTHER” type reactions to news of this patent, and those didn’t surprise me – honestly I felt a little like the patent was obtrusive mywelf – but useful, and I could see people using this feature – being able to search among the media that they have consumed in the past. Nice, now this is a patent with some meat on its bones! What is up with the foreign aspect tho? Can’t file int he US for some reason or is their some weird competitor they are trying to knock out. This really reinforces my personal commitment to authors, entities, and the semantic web. Thanks for always being on top of this Bill! Amazing patent. At this rate, Google will know more about us than what we do about overselves. All said and done, Google is always a step ahead of industry. Google does file some patents in international filings sometimes, which means that I have to search through those to find some filings that haven’t been published in american patent filings yet. I don’t think they are trying to hide those from me, but it does make it harder to find them. Google may have just filed a patent, but the practice has been happening for a long time. Iâ€™ve noticed this, along with millions of users, no doubt. However, the million-dollar question is if a personâ€™s own personalized search results can affect your site’s ranking if they happen to land on your page. Meaning, with respect to their aggregate search patterns, your page shouldnâ€™t have been the final destination? And to what extent are we marginalized in finding new information based on old search habits? Thanks for an interesting read Bill. Thanks for nice post. i learn some new thing from your post. But i hope Google will overcome quickly. Hi, Bill Slawski Google always doing something interesting.And this is sounds interesting feature in googleâ€™s.Thanks Bill Slawski I this know from your post.Thanks to you for sharing this post.